Growing up in NYC one can’t describe the sheer magic of the place. It’s also tough to describe how at times NYC can be the greatest thing on this Earth as well as just one big balled fist of anxiety and emotion. Harvey Stein captures the emotion of New York along with the good, bad, and ugly of street life. 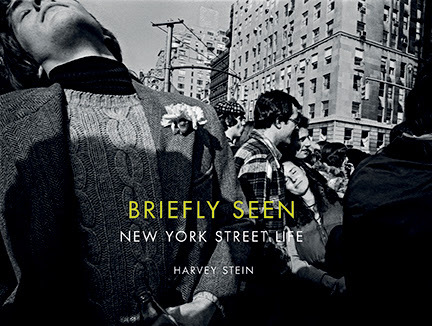 Street photography has taken a life of its own within the last few years however this book showcases Harvey’s work for the past 40 years of living in New York. The photos in this book are from 1974 to 2014. That’s a long time to be on an island that is arguably the center of the world. When you flip through the pages of Briefly Seen you get a sense of wonder about the city as well as a sense of urgency. The latter is what interests me because Harvey captured one of the things that makes the city so unique and that is the fact that we all have somewhere to be. If you’re walking the streets of Manhattan it’s generally not without purpose. If you have ever speed walked down a crowded street to get to a meeting you will be in the midst of a veritable smorgasbord of sights, sounds, and even smells that you just simply don’t have time for. 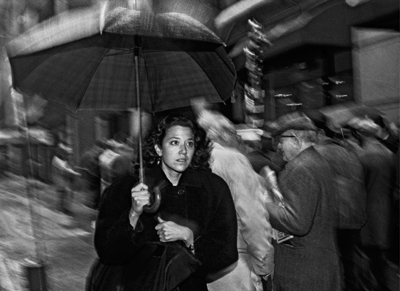 As an avid people watcher myself I really love how Harvey captures the rush and the hint of a story in the subjects of his photos. When walking the city streets I often wonder “Hey, where is THAT guy going..” or “Man! That’s a weird looking kid!” or “Why’s that lady just standing there?” These are moments that if you’re ever in New York for even an afternoon you would feel. The city is just so filled to the brim with every kind of person at any given time and truth be told – it’s wonderful. Anyone can relate to these photos because we have all been there. We have all seen these scenes again and again and can probably remember the last time we were conscious of being in such a massive crowd. It’s not an every day experience for most of the world. New York is so unique in and of itself that books like this are necessary to capture these moments that are just simply gone forever. Where else can you find people of literally every age, gender, and race walking down the same block across an entire city? The book also captures something very unique, which is that even though as New Yorkers we live amongst a throng of people – we generally go it alone. 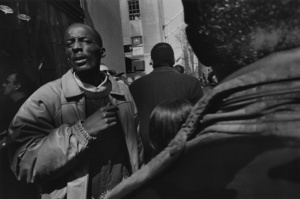 In many instances these photos although many snapped in crowds – capture the solidarity of the individual. Everyone has their own agenda and it varies dramatically from whoever you might be walking next to. The book itself is gorgeous. It’s a nice, heavy, well put together book that contains a ton of content and a ton of hang-able photos. We can look into these windows and see things that speak to us and Harvey does a fantastic job of capturing photos that have a voice.